Mysterious Reviews, mysteries reviewed by the Hidden Staircase Mystery Books, is publishing a new review of The Violet Hour by Daniel Judson. For our blog readers, we are printing it first here in advance of its publication on our website. Review: It takes just three days to turn Cal Rakowski from a quiet, hard-working, honest auto mechanic into a man running for his life in The Violet Hour, the fifth suspense thriller by Daniel Judson. Cal’s father and his older brother were both criminals. For this reason Cal keeps a low profile, hoping to keep the Rakowski name out of the news. He works and lives in Bridgehampton, about as far removed from the Hamptons as you can get. His shop is in a rundown three pit garage with a dilapidated home attached. His boss, Eric Carver, pays him “under-the-table” for the work he does. He lives rent free with all utilities paid. Normally he spends Fridays with his friend, Lebell, bar hopping and occasionally drinking too much, but staying out of trouble. One day an old friend, Heather Pamona, calls Cal telling him that she is six months pregnant and she could sure use his help. She has just run away from her abusive husband, Ronnie, and needs somewhere to stay that he won’t find her. Cal suggests that she come to his place. He assures her will take care of her and keep her safe. That Friday, Lebell doesn’t show up for their evening of fun, nor does he call or answer his cell when Cal calls him. But this wouldn't be the first time Lebell skipped out, so Cal isn't overly concerned. It's Halloween weekend, and Cal finds himself at a party where Heather's husband, Ronnie, is present. As is Heather's sister, Amanda, though it isn't clear if she's there voluntarily or not. Most surprising, though, is the presence of Lobell and his boss Eric, who Cal overhears talking about Lebell's criminal past. Why didn’t Cal know about it? They had been friends for years. What has his friend become involved with now? And what does this have to do with Ronnie Pamona and Eric Carver? Cal, confused by the association of his friend, his boss and Heather’s husband, first makes sure that the sisters are safe, then goes back to find his friend to help him. In doing so, he becomes involved in a criminal activity himself, and when trying to help Lebell flee from the killer, he too must go into hiding. 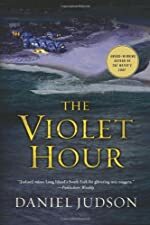 The Violet Hour is a compelling, if darkly written thriller that exposes abuse of power and corruption in the ranks of authority and compassion and good will between friends who have no one else to turn to. Cal's transformation from mild-mannered homebody to man of action is not as unexpected as it might initially appear; as a mechanic, he's good at tackling a problem, looking at the big picture and determining what he needs to do make things work. He's smart, pro-active, and resourceful. The book's success as a suspense novel is largely due to the strength of character he exhibits. It's all quite well done. Special thanks to guest reviewer Betty of The Betz Review for contributing her review of The Violet Hour and to St. Martin's Minotaur for providing a copy of the book for this review. If you are interested in purchasing The Violet Hour from Amazon.com, please click the button to the right. Synopsis (from the publisher): Bridgehampton auto mechanic Caleb Rakowski gets paid under the table at his friend Eric Carver's auto repair shop and lives in an apartment above. He's good at his job, he's a hard worker, and he’s making a decent living. But right now he's sheltering a pregnant friend who’ll do anything to keep her abusive husband away from herself and her baby. Cal has sworn to protect her; that's the kind of guy he is, a true friend. Little does he know, though, the trouble destined to come down on them over the course of three days---Mischief Night, Halloween, and the Day of the Dead---when he learns the truth about Eric Carver and what he's been hiding all these years. And little does Cal know how those lies will force him to risk everything to save the people closest to him.